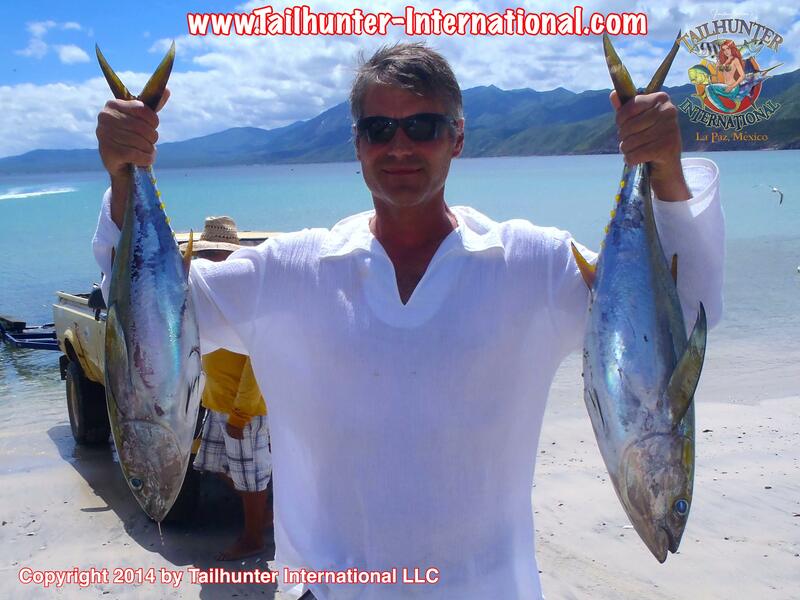 Kris Honkola from San Rafael CA was a first-time visitor with Tailhunter and set out to get a wahoo with us. On his very first day he tagged up this big-headed speedster south of Cerralvo Island. Cathy Corda, here with husband Craig, had a pretty fantastic day. 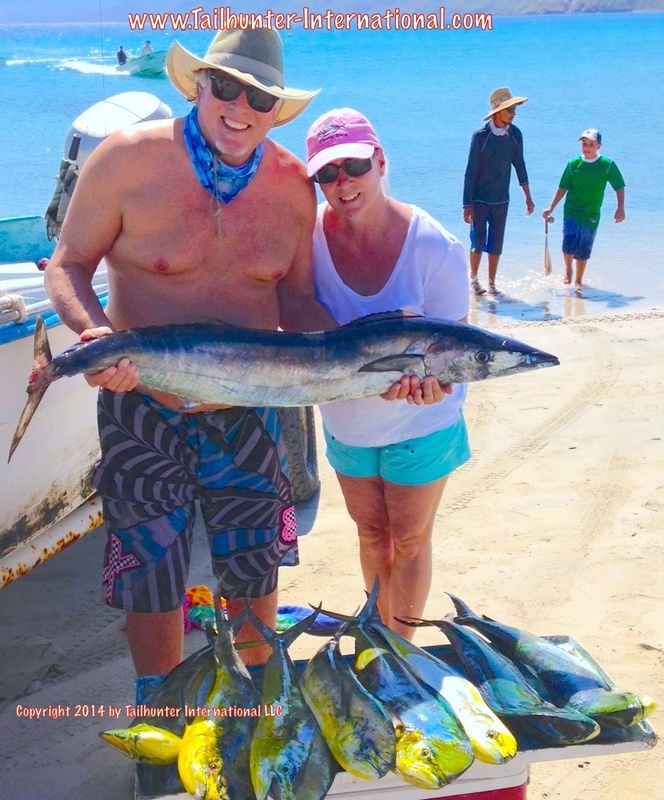 Not only did they get into the dorado school big-time, but Cathy got her first wahoo. What makes it more remarkable is that the fish bent out the hook and when they got it aboard…THE FISH WAS NOT HOOKED! The line made a half-hitch loop around the tail and had lassoed the fish! Great story! Our long-time amigos from the San Francisco Bay area, Bill Lee and John McLucas had a week’s-worth of good fishing with our Las Arenas fleet. 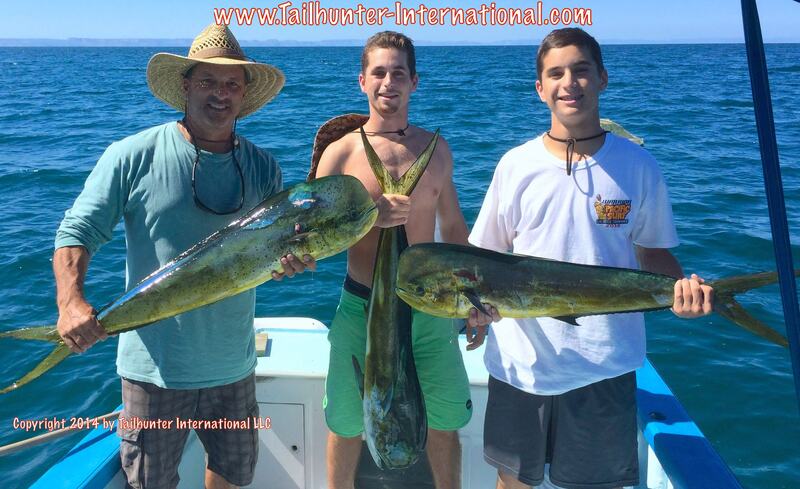 Here’s a sample of dorado, cabrilla and a rainbow runner. 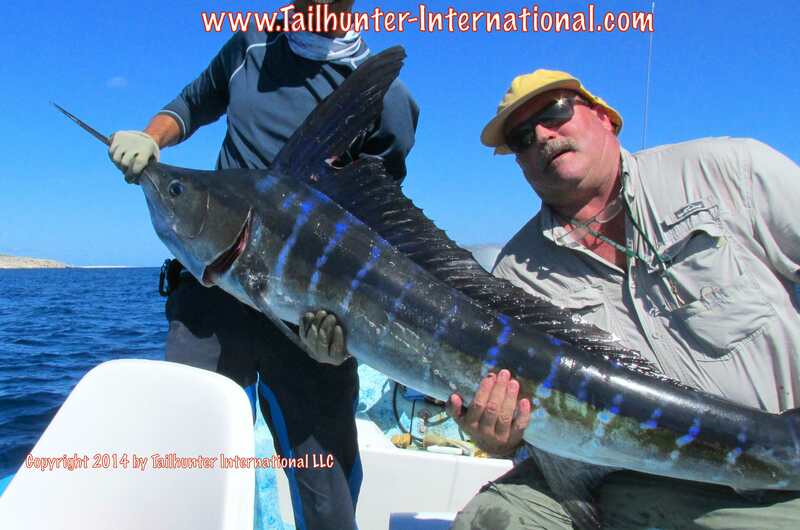 It was a pretty good week for billfish…marlin and sailfish with a remarkable number of hookups! Most caught fish were released. Alexa Kadota took these spectacular photos right close to shore as her dad’s sailfish fought close to the panga. 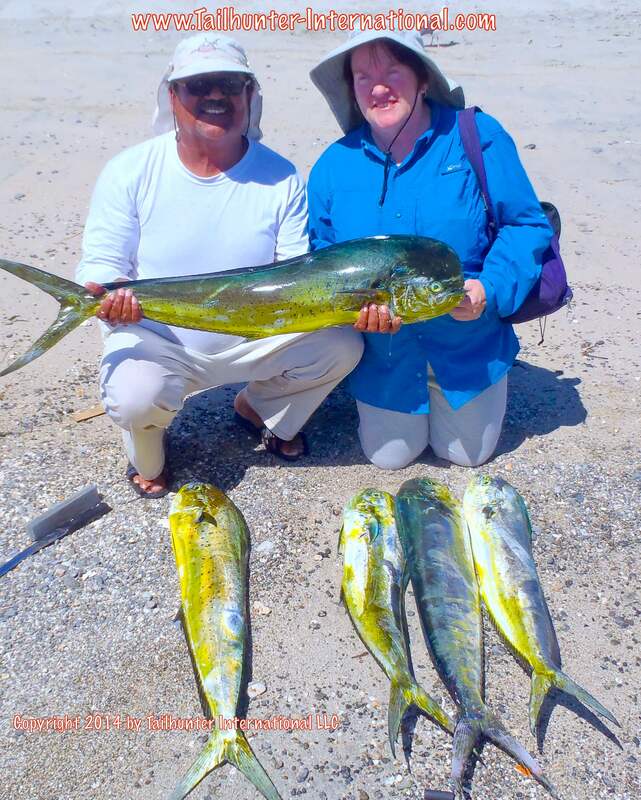 Our new amiga from Utah, Janie Edge and her husband, Randy were fishing with Captain Victor and did pretty good on some schoolie dorado. Nothing like a vacation with dad and getting pulled outta school! 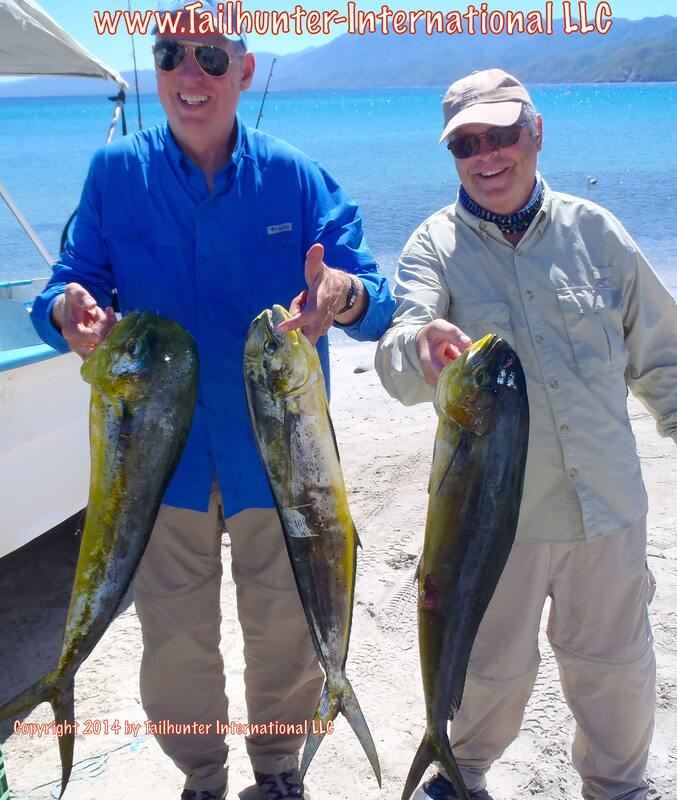 John Rogers from San Ramon, CA, took his boys, Jared and Jay out for a few days fishing with us and show off some of their dorado they caught north of La Paz around Espirito Santo Island. Oregon in the house as Captain Armando poses with Dave Lindell and Leonard Post on the beach at Las Arenas with some of their mahi catch. Our amigos come from the Pendleton, Oregon area. 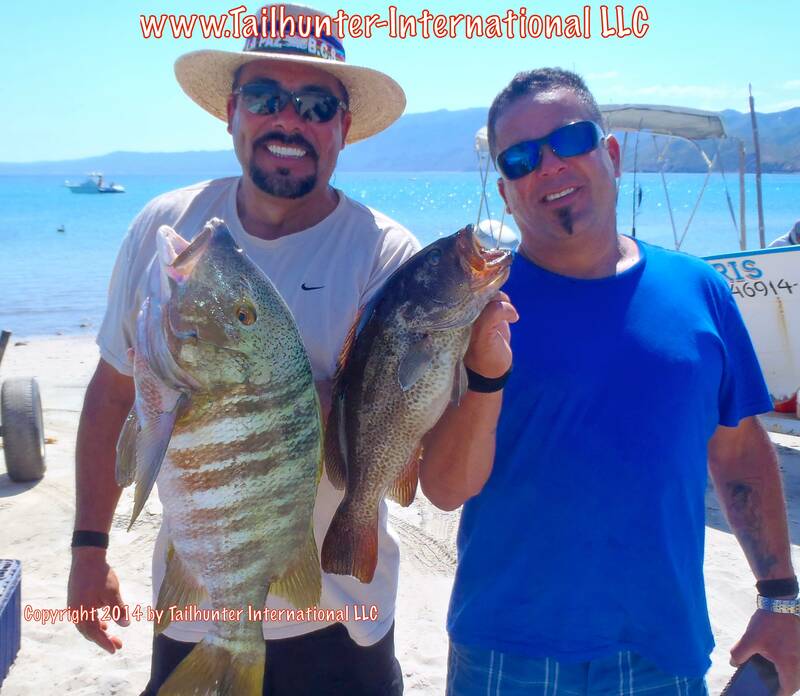 These two brothers had to be some of the funniest guys all week…Andy and Rafi Montejano pose with a big pargo and cabrilla which we saw more of this week as the weather and conditions change. You can tell waters are getting a little cooler because we don’t normally get pompano except in the springtime. 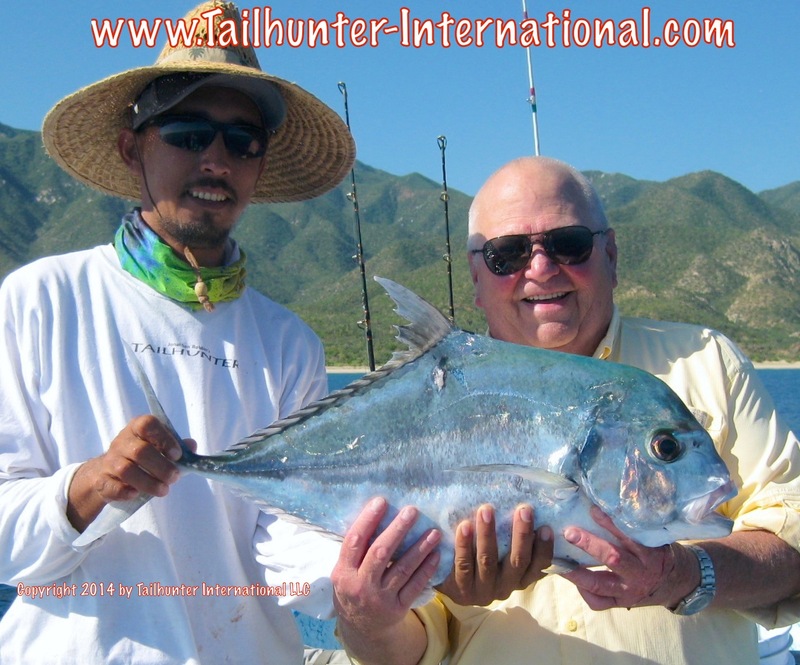 However, our amigo John Ehlers from the Denver CO area, got this tasty pompano just off Bahia de los Muertos with Captain Pancho. 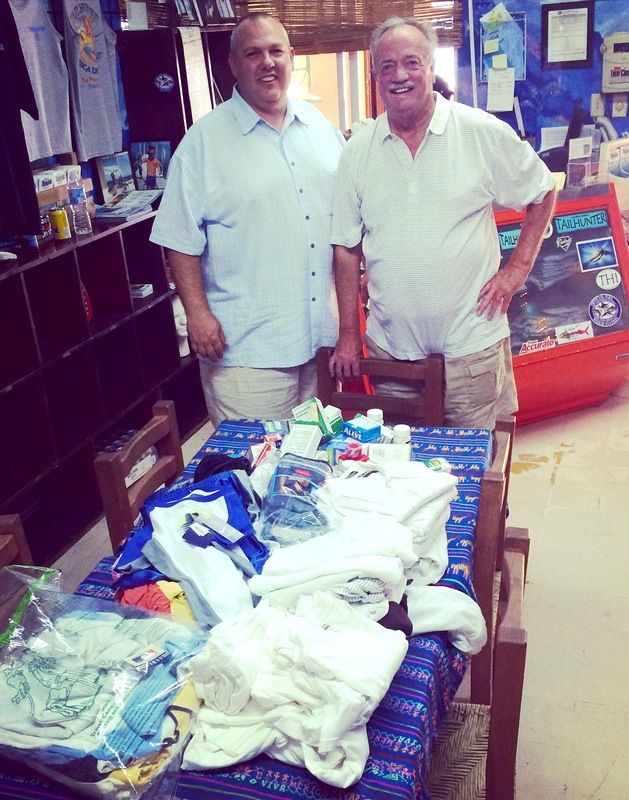 Captain Archangel looks on as Dr. Dennis Harper has his hands full of dorado and a trophy barred pargo that will make for some great eating. They are on the beach at Bahia de los Muertos. 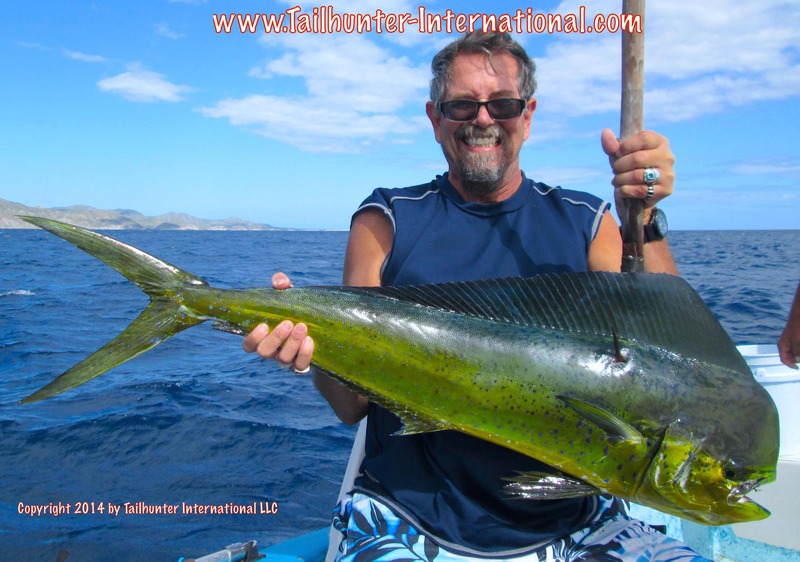 Great shot, big smile and great pose on a bull dorado with Bill Lee from the San Francisco Bay area. 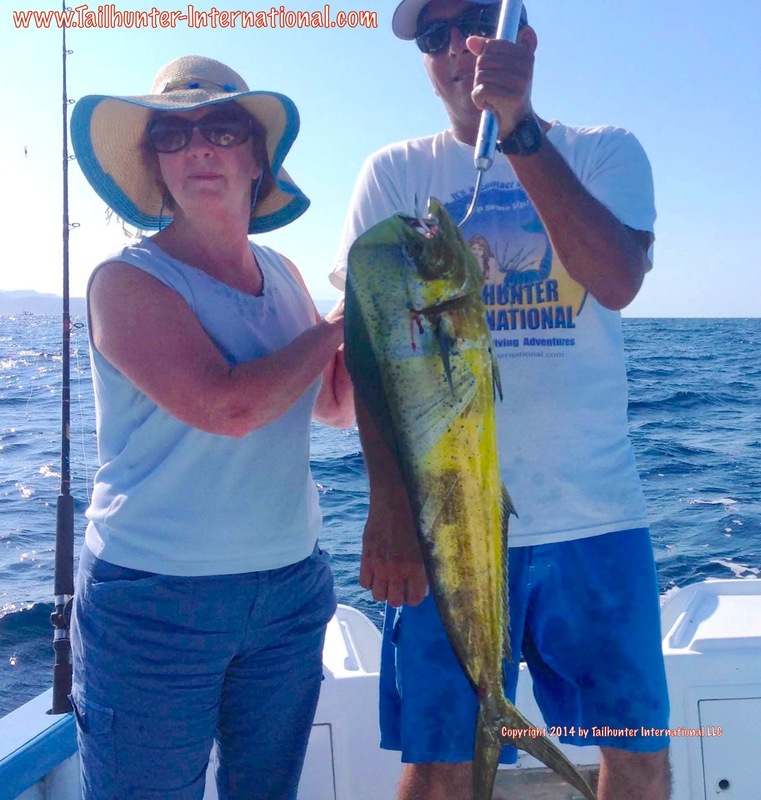 Captain Joel with Tina Harper who was fishing this week with us for the first time and did well on the dorado. She caught this fish near Espirito Santo Island in the channel. 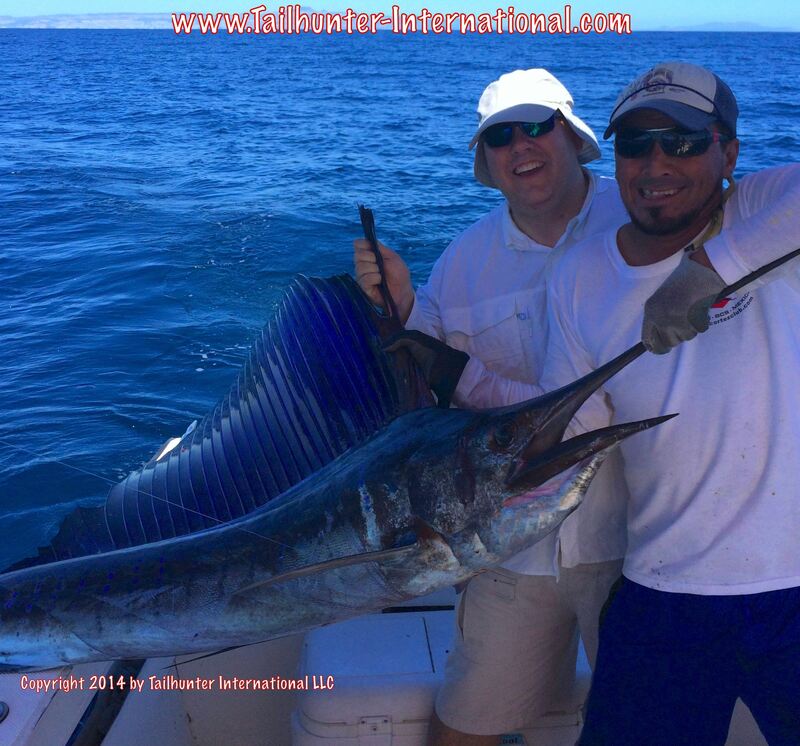 The pro…Danny Kadota…with another pro, our Captain Victor and the results…a big big wahoo. One of several that Danny caught. We could not be asking for better conditions right now these last two weeks or so. Air temperatures have dropped significantly down to the low to mid-90’s. The humidity is gone so it’s just great sunshine. Water temps are still in the mid-80’s. And, although winds seem to be gradually increasing, there’s just a hint of perfect breeze each day. Barely a cloud in the sky. Nights are ideal and in the 70’s. If you’re walking around La Paz, it’s like being in a post card. Basically, I think it means conditions are changing. They’re moving from the warmer summer days now tapering into our late fall bite. Fishing has been OK to good for the most part. Not spectacular, but there were some nice highlights. I think we’re in transition now for the seasons. However, for most anglers fishing a few days, everyone is getting fish. There’s some nice highlights and bonus, and some days when the dorado go crazy but then there’s others when the bite drops off and gets a little more picky. Like I said, things are transitioning. 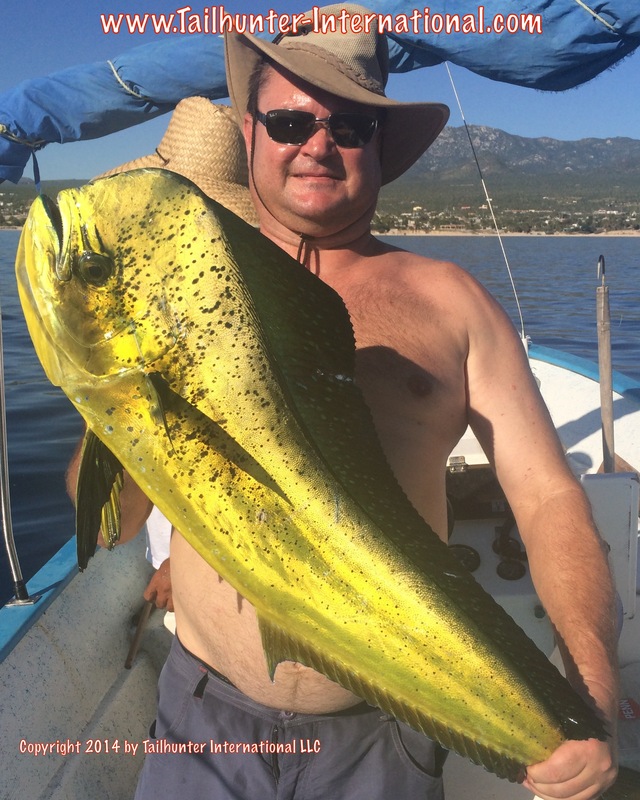 Dorado are still our mainstay with fish in the 10-20 pound class mostly. Some larger. Quite few smaller. Great fun on light tackle. Most of the larger fish have been lost, but we have seen some in the 40 pound category come and go…and keep going! But, dorado make up about 70% of our bite. But the fish seem more scattered and wide-ranging. There are still some concentrated schools, but they seem to be breaking up and moving quite a bit. One day we find the spots and other days it’s hunt-and-peck. It changes almost daily. However, that’s been rounded out with a pretty nice bite on billfish. 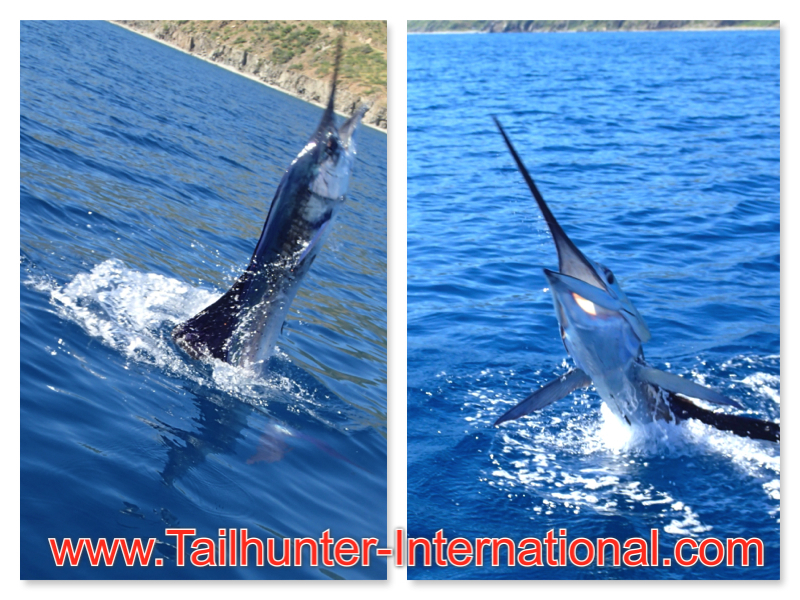 Striped marlin are around as well as blue and black marlin. But, the big surprise have been the number of sailfish around. We had some days when there were multiple hook-ups on our pangas. One day one of our pangas hooked 4 and were able to release 3. Another released 2. Several others released 1’s and 2’s and numerous other billfish have been seen feeding on bait or in the middle of the bonito and dorado schools. 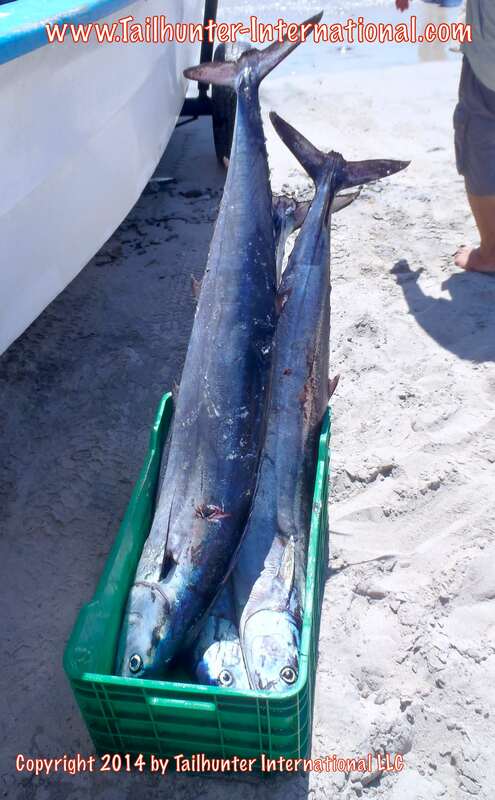 We had two large blue marlin hooked and dropped during the week. The variety this time of year has been increasing as well. 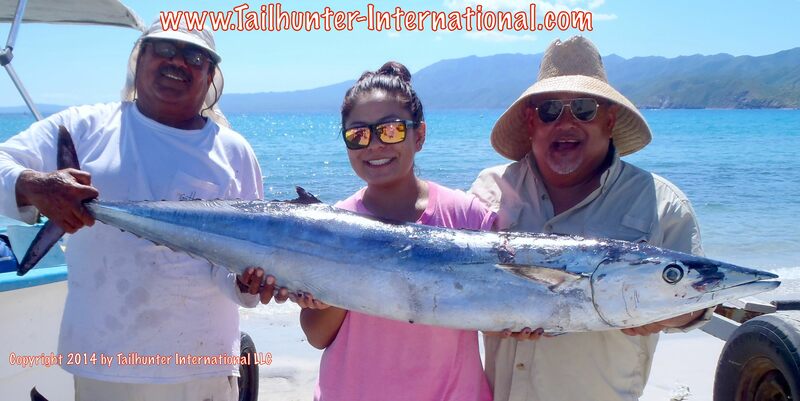 In addition to the billfish and dorado, wahoo keep popping up near Espirito Santo Island and inshore, we’re getting more pargo, cabrilla, red snapper, and even some sierra which is a sure indication that waters are cooling a bit. Additionally, we’re getting rainbow runners, lots of bonito, jack crevalle and still finding some school-sized rooster fish along the beaches. Not alot of big fish, but … Lots of great action! HURRICANE DONATIONS KEEP COMING IN! 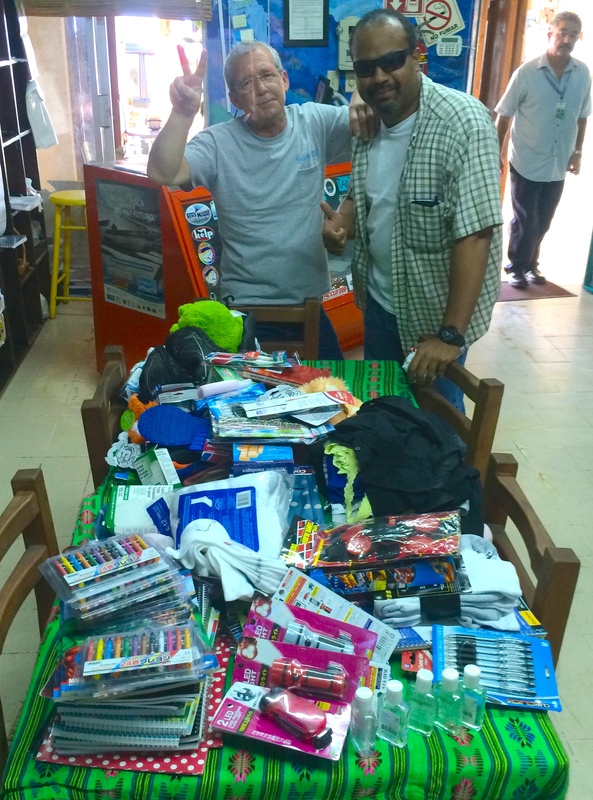 Roy Zimmerman and Barron Lowery with a double-table full of supplies! Jane and Randy Edge from Utah with some strange-looking guy who had been cleaning fish and pulled into the picture! Thank you everyone! Jill is having the items sent to several different charities and communities in town depending on the needs and these things are going DIRECT to those who need them, not to any agency. 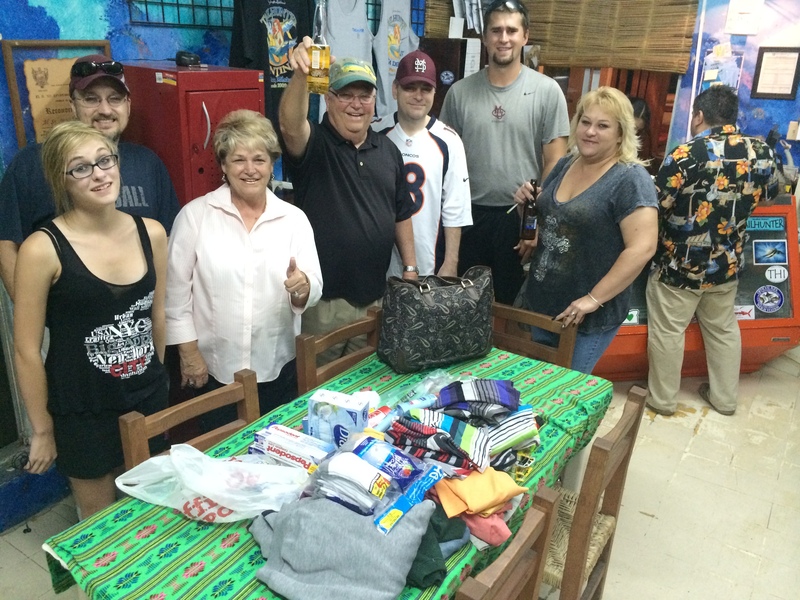 So YOUR donations are getting put directly into the hands of those who need them! Wahoo like these were the highlight of a somewhat erratic week of fishing that saw some great action, but also some slow fishing during the middle of the week. However, the appearance of these speedy trophy fish were a big plus around the south end of Cerralvo Island. 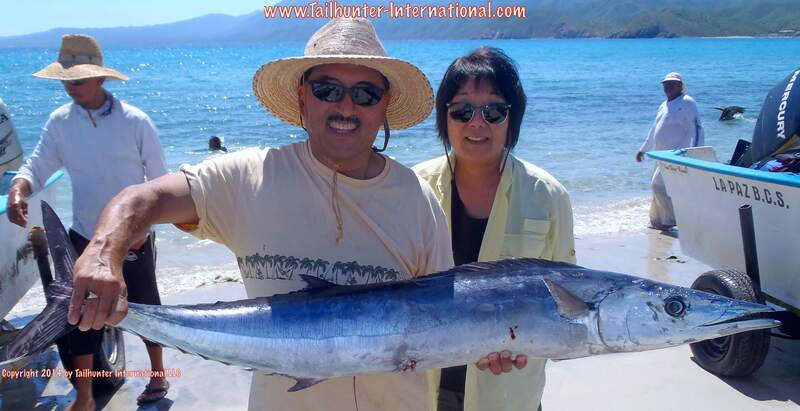 Jeff Sakuda and Marianne Sugawara make several trips a year to La Paz and had a good day to start with this big-headed wahoo while they pose on the beach at Bahia de los Muertos. 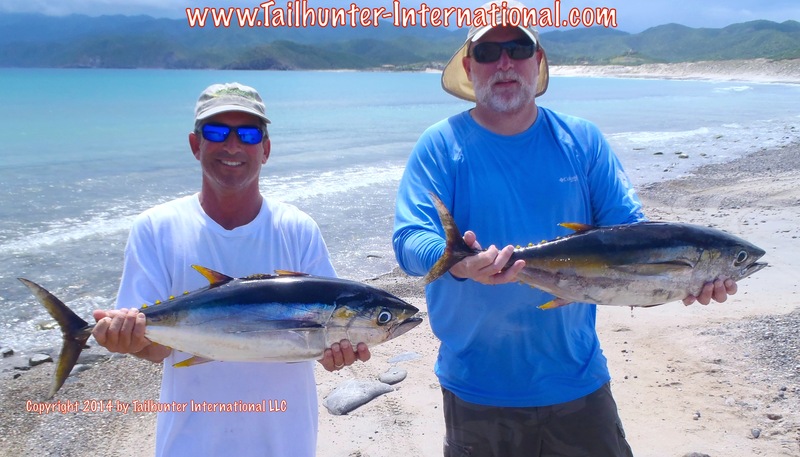 John Rogers from San Ramon CA has fished with us before, but says his boys, Jay and Jared are now “hooked” and “can’t wait to come back!” after three days of fishing like this including dorado, cabrilla, pargo, bonito and their first marlin. Captain Blas helps out our Washington amigo, Nash Johnson, with a nice sailfish that he battled on light tackle for 45 minutes north of La Paz. The fish was released. They also got dorado as well. 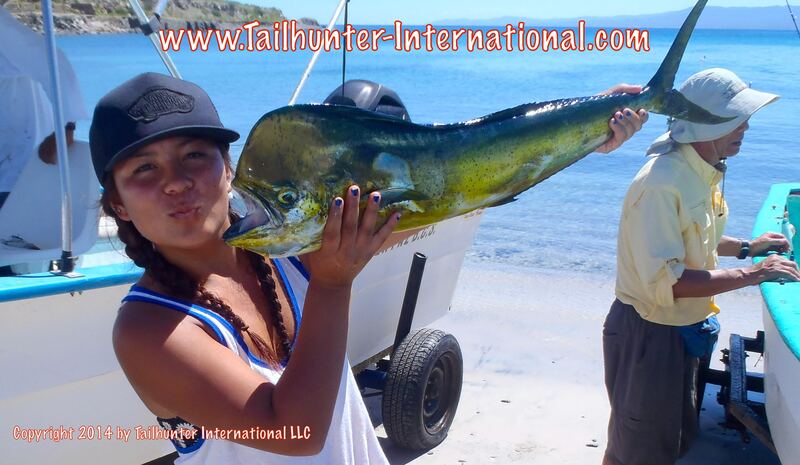 Great pose from Alexa Kadota with one of several dorado she caught while fishing with dad with our Tailhunter Las Arenas fleet. 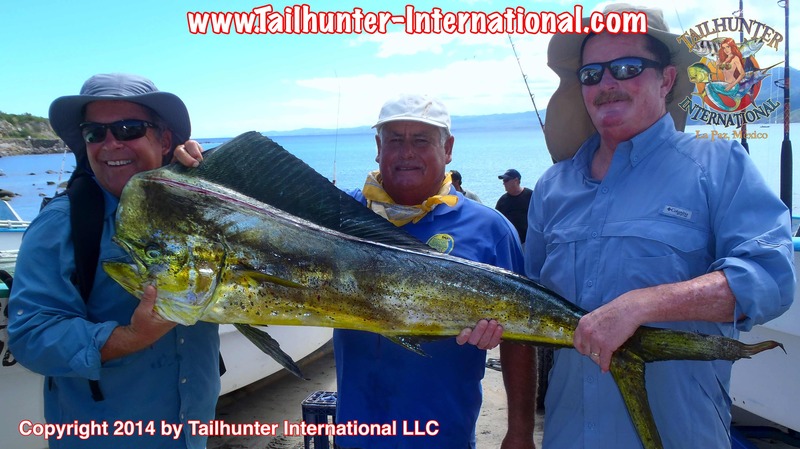 Big bull in the boat for our Idaho amigo, Steve Snead, who put this bull dorado in the panga while fishing with Captain Joel ear Espirito Santo Island. 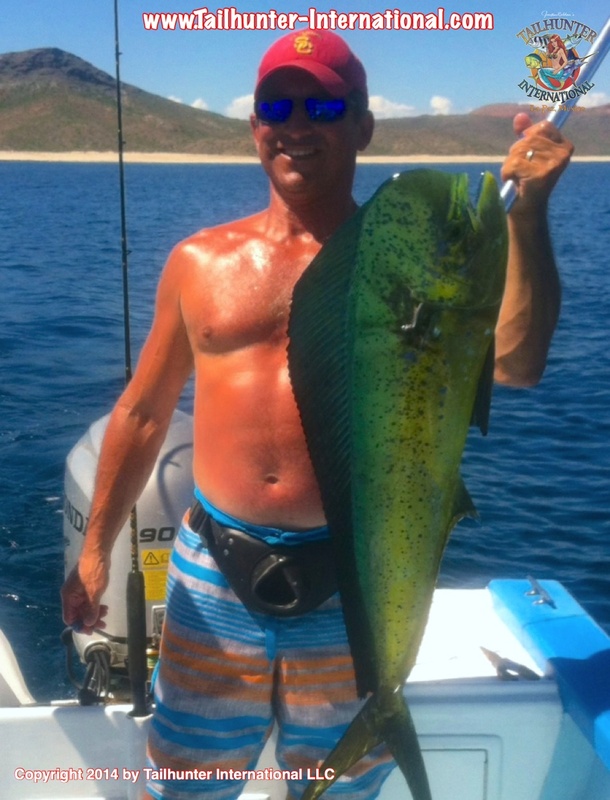 Mike Vonderahe and Mark Chism had to almost canceled their trip after Hurricane Odile, but were able to make it down from Oregon and started their fishing days off with some decent dorado fishing like these! They also got in some scuba diving later in the week with whale sharks! Bob Layko from Vancouver WA loves to come down each year to celebrate his birthday with his cousin, Craig Brown. 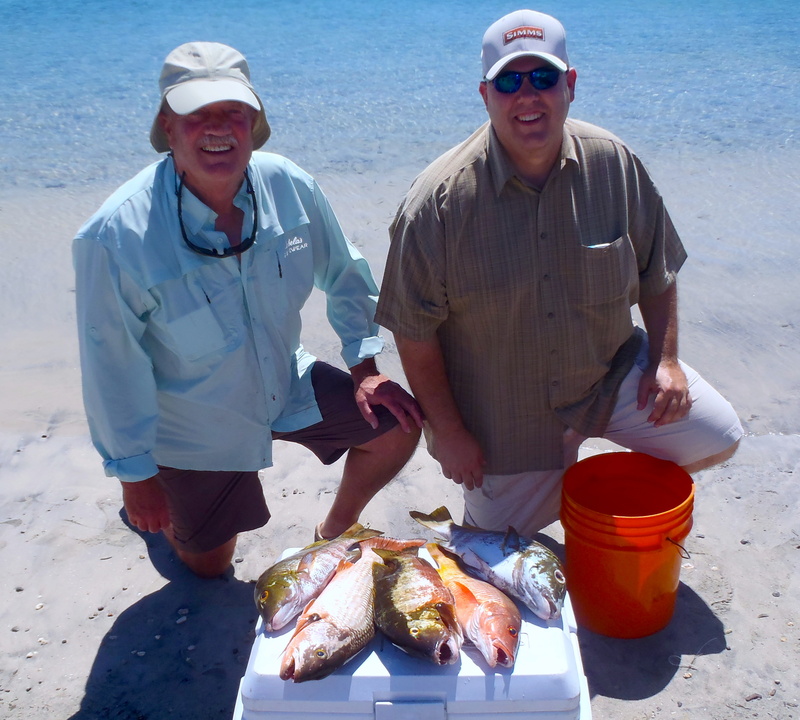 Captain Pancho poses with Bob and Craig on the sand to show off quite a variety of fish including dorado, palometas, pargo and a cabrilla. Big smiles for a big cabrilla caught by Niels Michaelsen who came all the way from Finland! Captain Boli jumps into the picture as well. 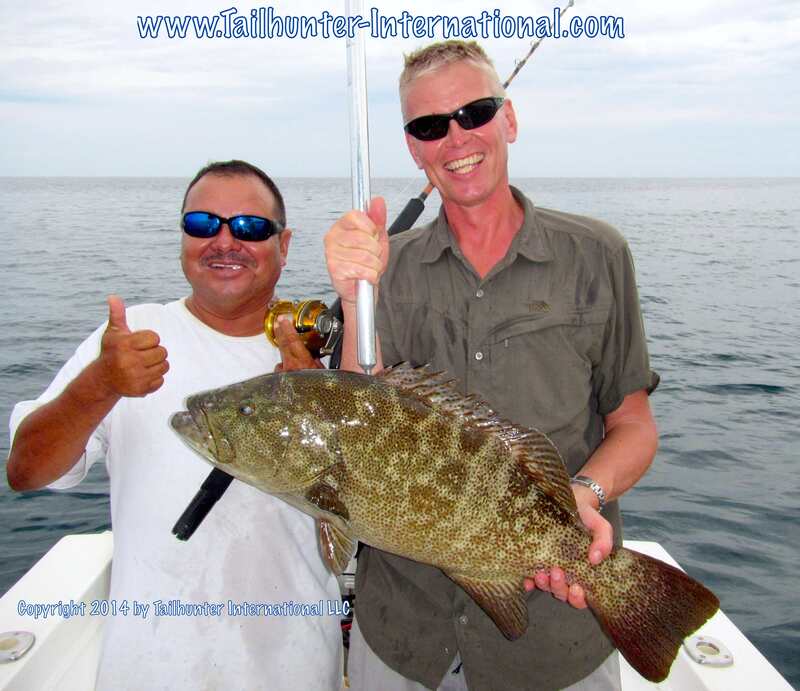 The big fish was taken near Espirito Santo Island. Just to show off some of the variety this week, Erick and Nash Johnson showed up with some pargo mulatto (barred pargo) and red snapper. Dad and son are from Washington. Not a bad day for fishing for Alexa Kadota. 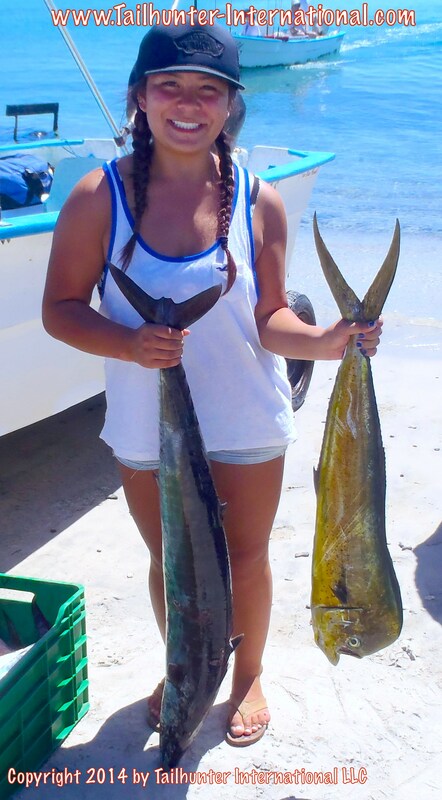 A nice dorado AND a nice wahoo in both hands! Great shot from our amigo from Denmark, Jens Riis, who had to cancel a kayak trip to the island, but logged in some extra fishing time instead. Fun, hard-core fisherman! Dennis is from Greece! 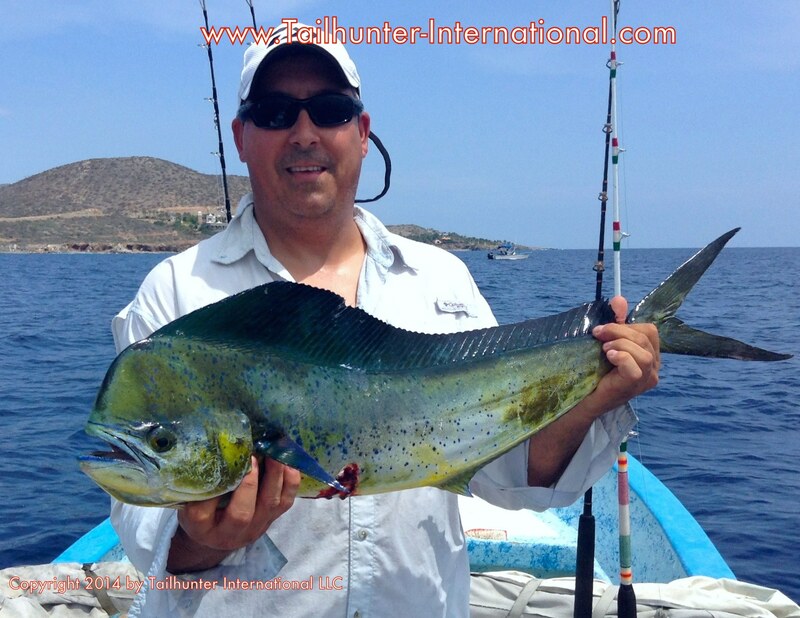 He’s got a nice bull dorado fishing with Captain Victor and our Tailhunter Las Arenas fleet. That’s El Sargento/ La Ventana in the background. We call him, “The Mayor!” He’s one of our most favorite amigos and was not going to let the hurricane prevent him from a few days in La Paz. 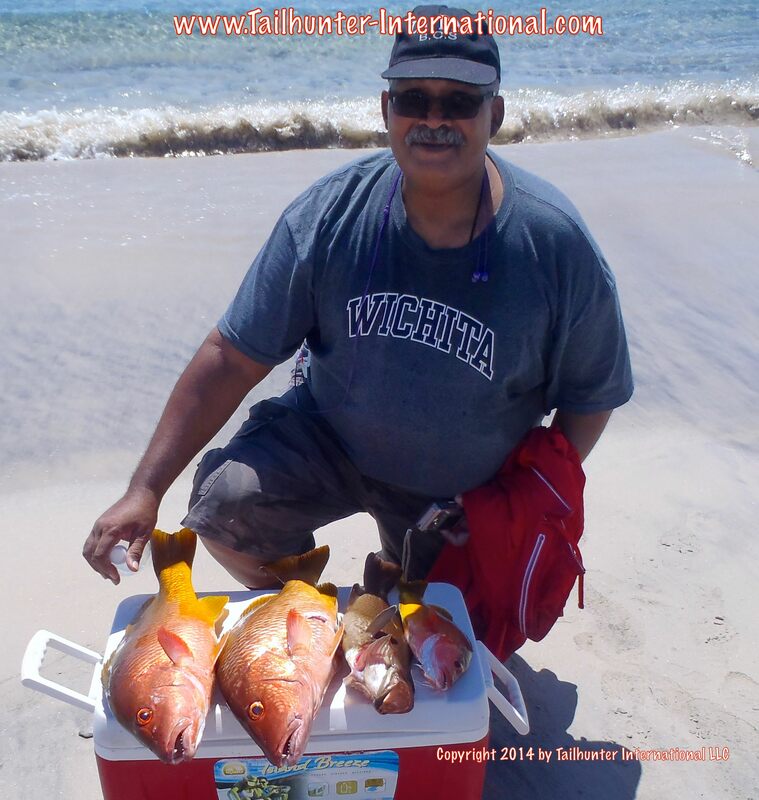 George Gill started his trip with some nice pargo and snapper. He also had a full day pulling on dorado as well! Double fisted dorado for Manny from San Diego. 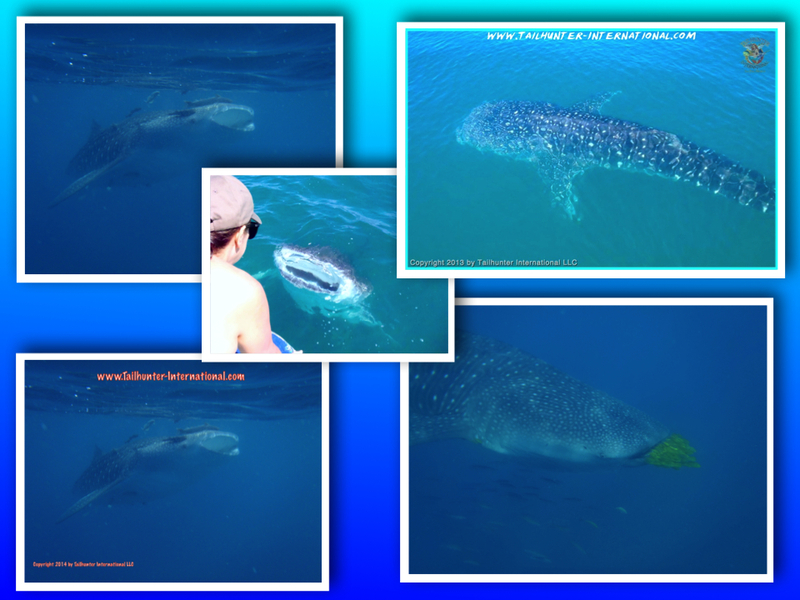 Whalesharks have returned to the warm shallow waters of La Paz and this past week was a great opportunity to snorkel with them! SOME SLOW SPOTS BUT OVERALL A DECENT WEEK OF FISHING WITH VARIETY! Perfect weather. Perfect water. Sunny days. Just a hint of breeze. Very little humidity. Could not ask for better conditions. It has been some of the best weather of the season. Like a postcard for the Chamber of Commerce! So…what happened to the fish? The week started well with a nice jag of wahoo and a smattering of tuna mixed in with decent dorado, especially around Cerralvo Island. 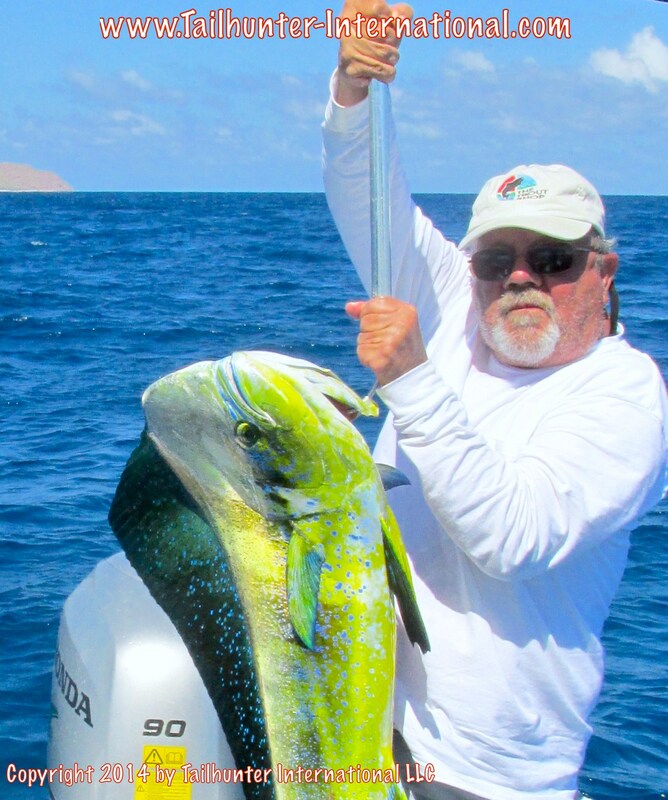 Dark-colored deep-running Rapalas put the hurt to the wahoo…up to 50 pounds…live bait enticed the tuna…while the dorado ate pretty much anything. 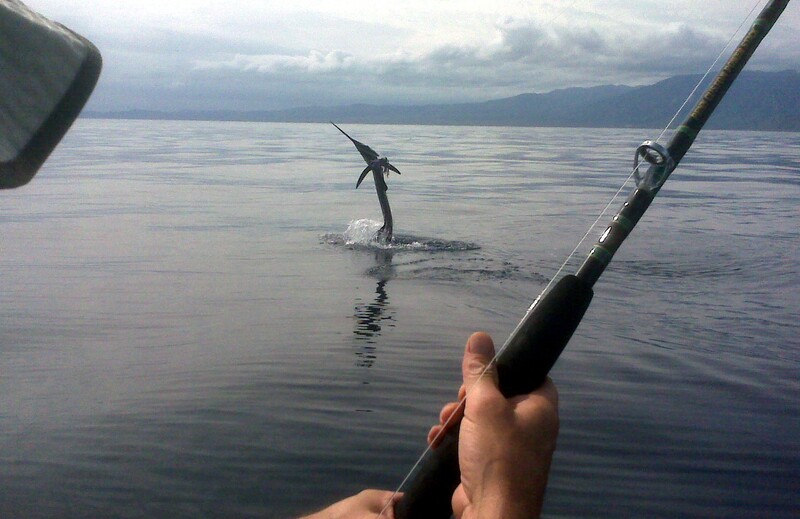 Some sailfish and marlin were hooked. The week looked promising! Then, it sort of just fizzled. It was like the fish took a holiday or something. 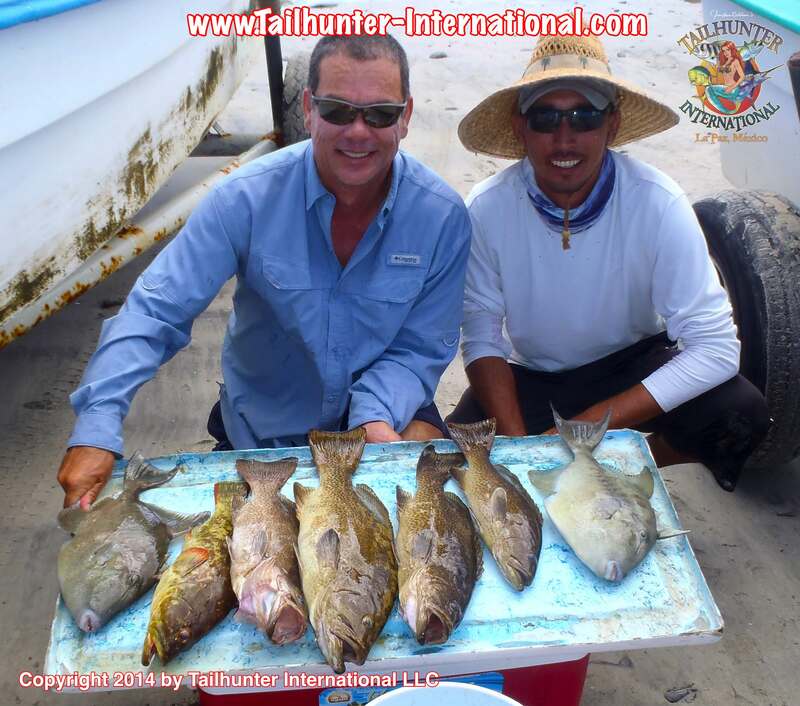 We struggled to get even a single dorado to bite and we resorted to having to go inshore for sierra, pargo and cabrilla. Mix it up with some rooster fish and jack crevalle and that’s the bite. I wish I knew. Last week when we had a full moon…in fact we had a full lunar eclipse…the fish bit pretty nicely. This week with a minimal moon, the fish are all lock-jawed. Maybe things are cooling down a little too fast. You can feel a bit of fall/winter in the air and northern winds are starting to creep in. So, maybe the fish are adjusting. But the middle of the week the bite literally just seemed to die. As we turned the corner into the weekend, thankfully things picked up! For no explainable reason. I didn’t notice anything that had changed. But… Dorado started crashing again plus a few wahoo, billfish and rockfish (pargo and cabrilla) so that rescued the latter part of our week. Hopefully things stay on the upside for awhile as we head down the backside of the season. DONATIONS FOR HURRICANE RELIEF SNOWBALL FROM GENEROUS AMIGOS! Collected over 500 pounds in two weeks! 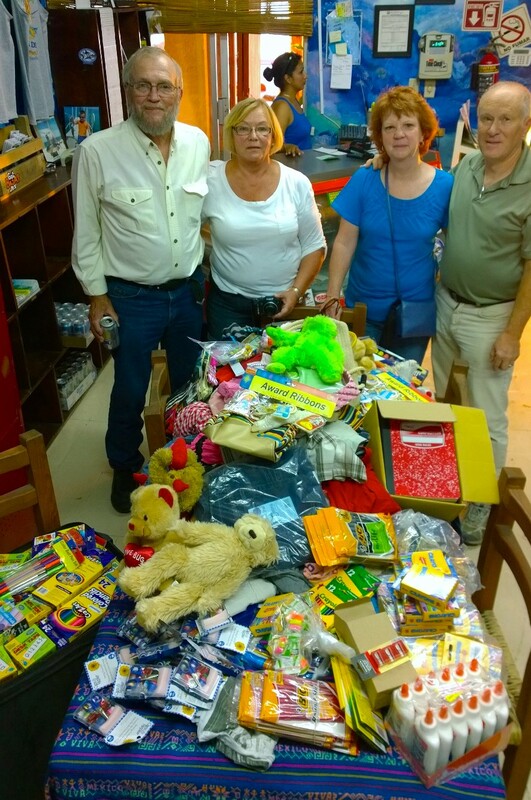 Alen Jones, Victonda Sheasby with Dr. Dennis and Tina Harper showed up with several tables full of school supplies, clothes for kids, playthings that filled about 100 pounds of ice chests and suitcases! 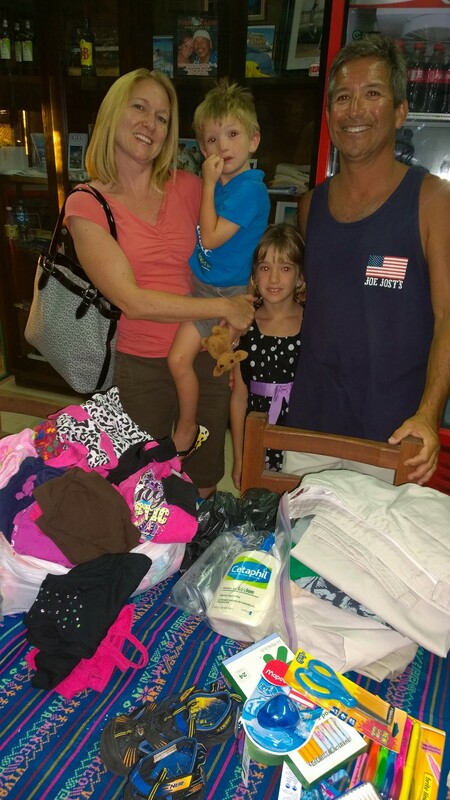 Nash and Steve Johnson from Washington got contributions from friends and neighbors and had a full load of clothes and medical items like aspirin and first aid supplies. 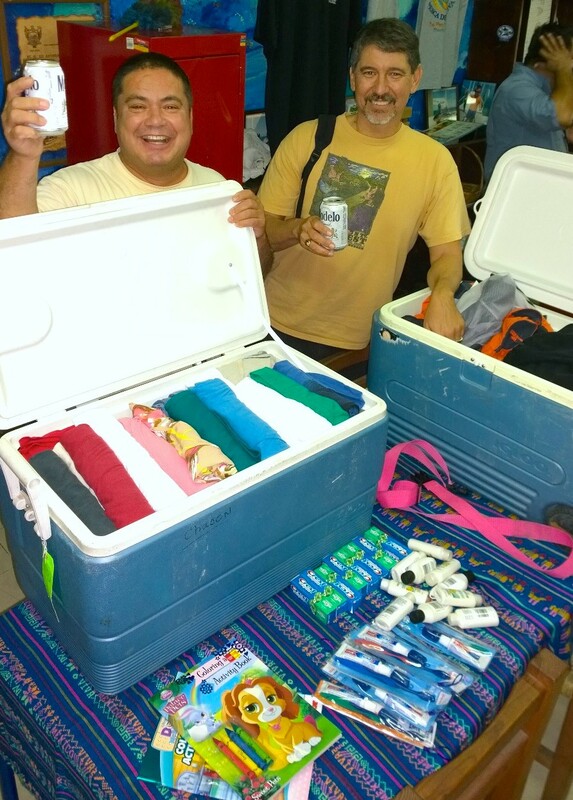 Two long-time friends of ours, “Modelo” Dave Pollard and Hector Chacon from S. California brought in two full ice chests stuffed to the limits with goods. 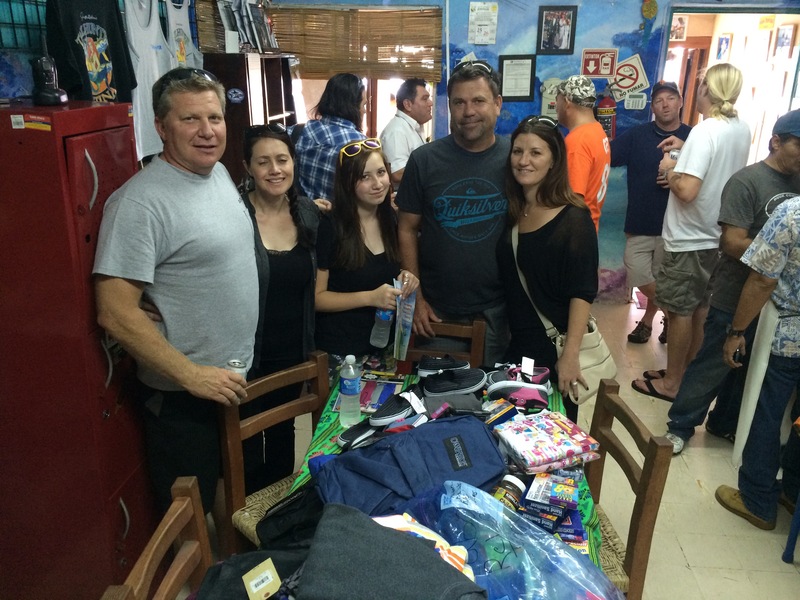 Their respective families put out the word with with friends and the donations started rolling in. In addition to travel-sized toothbrushes and toothpaste, shampoos and school items, their daughters hand rolled dozens of t-shirts so that could pack tightly into two 70-quart ice chests! The generosity continues. It started as a trickle just after Hurricane Odile almost a month ago and has turned into a wonderful flood and outpouring from so many of our friends and clients. 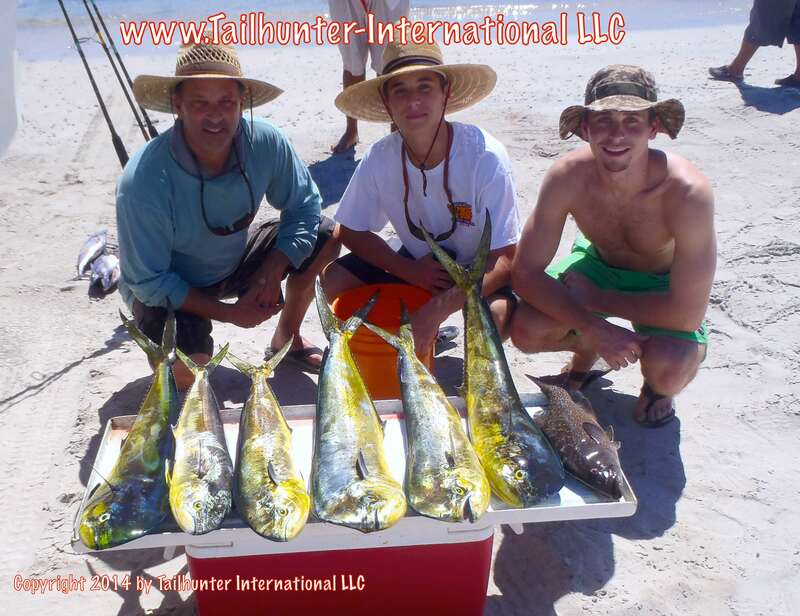 Over the last two weeks we have been posting pictures of some of our Tailhunter friends, and there are more this week. However, this is by no means all of them! There have been so many donations. Some bring enough for a group of sherpas to carry. Others bring a bag or two or fill some empty space in the corner of a suitcase or tackle box. It’s all fantastic! For those who lost so much…or everything…it’s all appreciated. And it’s almost overwhelming that we’re speechlessly grateful. Since Jill started the drive, she’s probably collected over 500 pounds of supplies and items in just the last TWO WEEKS ALONE! And more arrives daily! She’s making sure it’s all accounted for and going to needy groups where it will do the most good. So on behalf of all of us at Tailhunters, God bless you all for your help and big hearts! We are blessed and humbled beyond words. Late breaking news! SUNDAY…Wow! Lookit this! WAHOO DAY! Anyone in the S. California fishing industry knows pro Danny Kadota. He and his daughter Alexa were with Captain Victor today and got THREE wahoo and had another one bite through 250 pound mono! Check out Alexa’s massive ‘hoo! FOOTBALL SEASON FINALLY? The football-sized yellowfin tuna finally made an appearance for the year. There weren’t many of them, but the sprinkling of fish were a nice surprise the last two weeks like this one by Steve Snead from Boise Idaho, who had a great week. He’s here with Captain Pancho. Captain Archangel with our Tailhunter Las Arenas fleet poses with Jim Adair and Brad Baker and one of the larger models of dorado we got this past week. They’re on the beach at Bahia de los Muertos. Don Busse found a hot spot for rock fish this past week showing off a nice rack of cabrilla and big triggers. Our amigo was fishing with Captain Pancho. Louie Sanchez, was not going to be denied his Baja trip to celebrate his 50th birthday and anniversary with his wife and family. After the hurricane, they jumped through all kinds of hoops to get down from home and Denver and got in some OK dorado fishing. 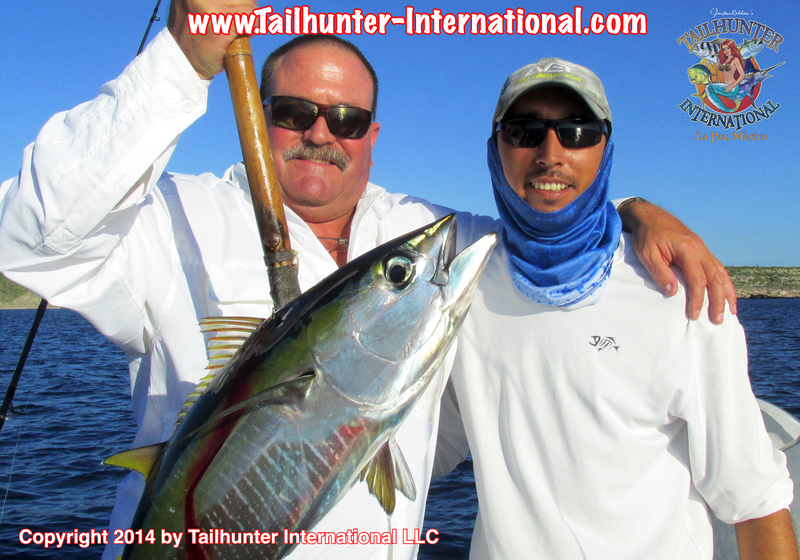 First-time tuna for Ken Campbell from Lakewood CA with amigo, Jeremy Friez (helping out holding up the tail). Next time we’ll get Ken to eat the heart…as is the custom with first-time tuna takers! Steve Snead had a great story. He finally got his marlin off the bucket list. He was already hurting from a bad back, then tied into this gorgeous 150-pound class striped marlin. On light tackle, Steve and his back battled the first for 45 tough minutes. He got the fish out just long enough to take a picture then released it swimming strong. He came back to shore and went bed with a big smile but completely whupped. She’s a champ! Young Sierra Sanchez is only 8-years-old, but was quite a trooper coming down to La Paz and fishing for the first time. 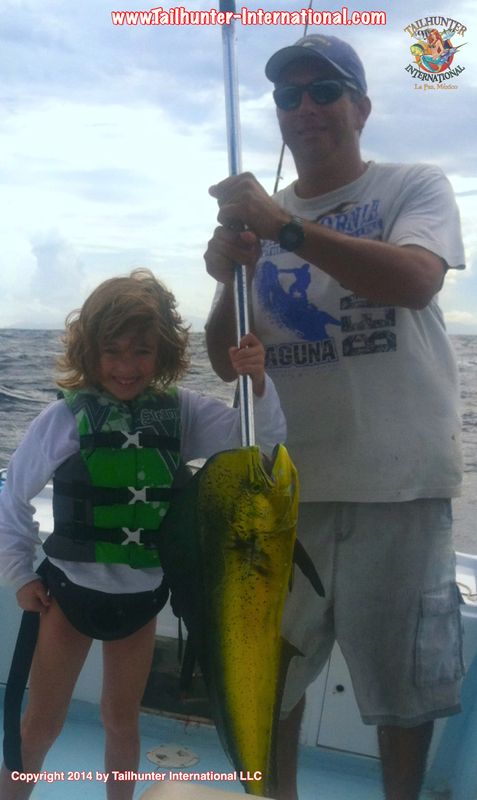 The youngster is from the Denver, Colorado area and shows off her first dorado proudly with Captain Joel. Determined to make it down, Steve Walker from idaho and his amigo, flew into Loreto then took our 5-hour shuttle to La Paz to make sure not to miss their fishing trip! 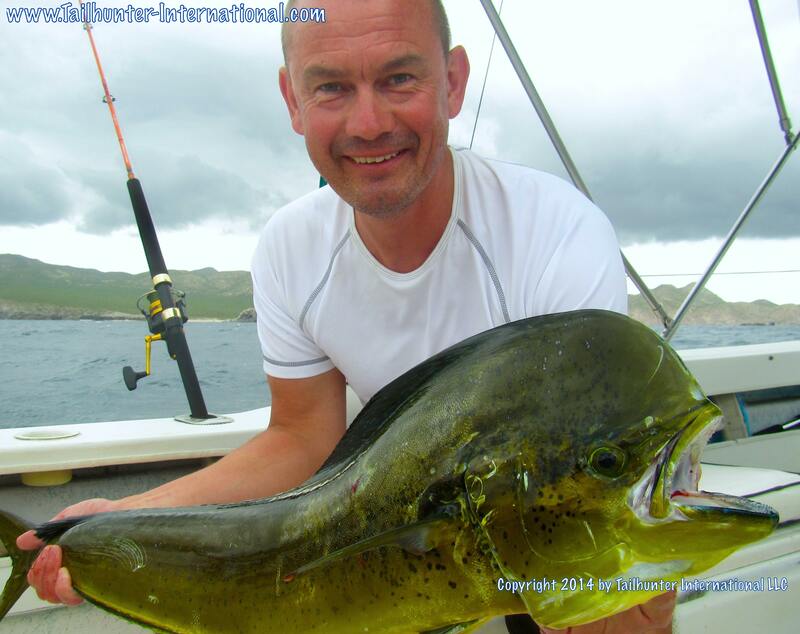 Steve’s got a nice big bull on the gaff here that he caught north of La Paz. I don’t know how he stays so clean fishing in all white clothes all day! 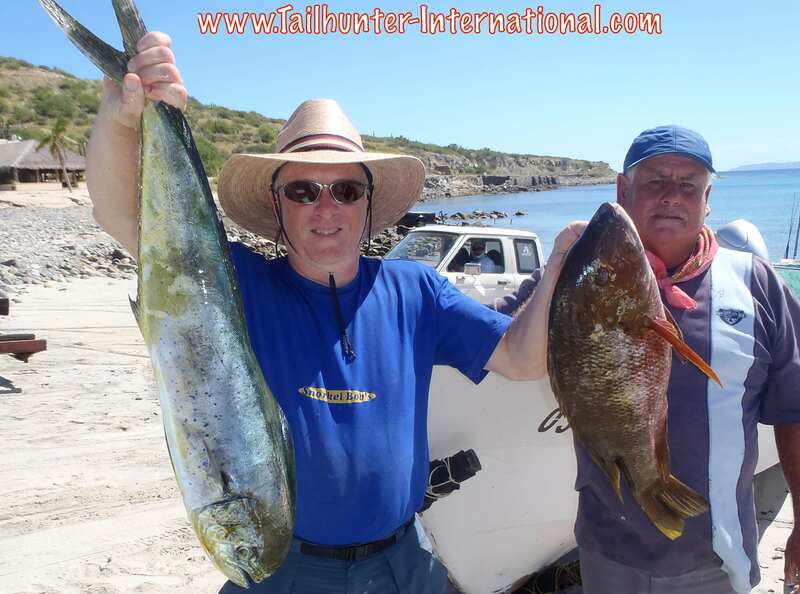 But, Chris Malley had a pretty good week including these two yellowfun tuna he caught off Bahia de Los Muertos! Don Busse and his gang…Ken Campbell…Jeremy Frieze…John Gibbs…Jim Adair…Brad Baker…Angelo Oliverio…and Chris Malley…brought in several hundred pounds of supplies and clothes for Jill’s hurricane relief efforts! it filled several duffle bags and ice chests! 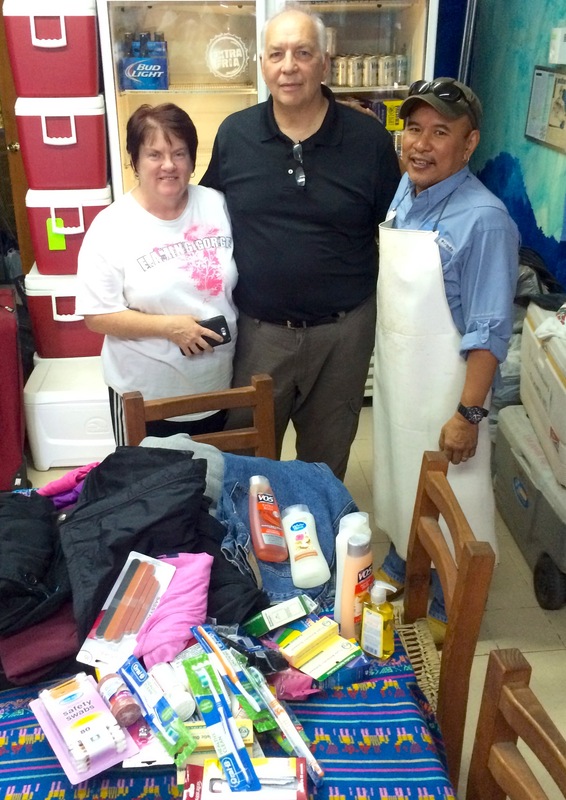 Since the hurricane, Jill has collected over 400 pounds of things for needy folks post-Odile. Wiley Randolph from Fullerton CA…another big heart ….and a great shopper…brought down brand new kids’ shoes, schools supplies and medical first aid things for Jill’s hurricane relief efforts. Jill, Cortez, Sierra and Louie Flores…all the way from Denver for the week and stuffed their bags with clothes, schools supplies and other great stuff for the hurricane relief. Big smiles and big hearts. Thanks to a wonderful family. AIRPORTS OPEN – FISHERMEN COMING BACK – SO ARE THE FISH! Since hurricane Odile, three weeks ago, we’ve played cat-and-mouse with some erratic weather that seems to keep popping up and dropping some thundershowers on us now and then. Mostly, it’s been great weather, but like the rest of the season, we do have to keep watching the weather reports and the horizon to check for building thunderheads. However, for the first time since as long as I can remember, I’m looking at the weather forecasts the last few days and into the next few weeks and there’s zero precipitation forecast. There are no little “weather icons” on the internet with little clouds and thunderbolts or rain icons on top of the daily advisories! We’ve got gorgeous 95 degree sunny weather for days and fishing conditions could not be better. As for the fishing, it’s making a comeback. The fish got hit pretty hard too with the crazy weather and green dirty water really mixed it up from the storms and the run-off and it takes times to settle in. Each week, the water seems to get a little better. Fishing isn’t great, but it’s good most days and there’s even some jags of “very good” thrown in. 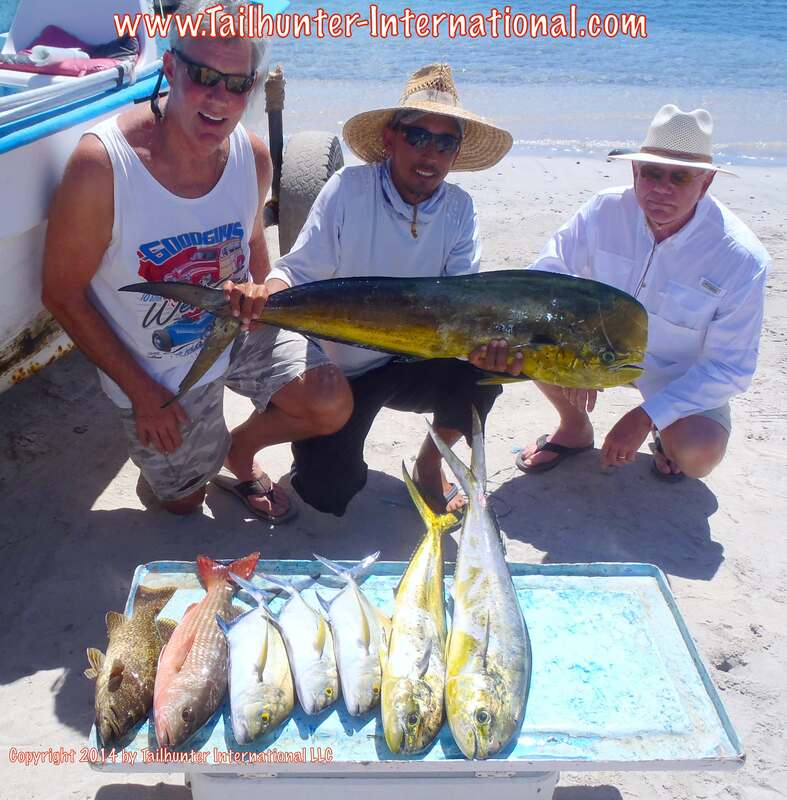 Dorado have been the most consistent players, especially for our Tailhunter La Paz fleet. 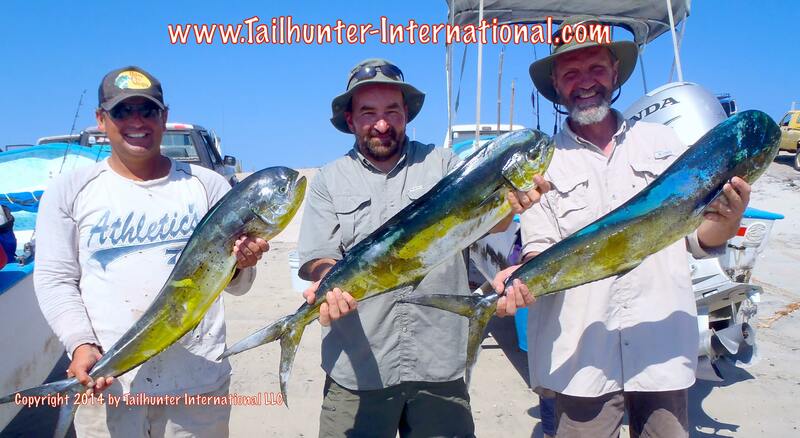 There are spots of dorado just inside La Paz Bay and in various places around Espirito Santo Island, but the best concentration and larger fish are around the Rosario / Las Cruces area in the channel between La Paz peninsula and Cerralvo Island. Fish aren’t bit, but they’re fun decent fish of 10-20 pounds with an occasional 30 pounder. Some days are better than others. Some boats will get limits some days while others right next to them will hit only a handful of fish or less. But, the fish are there! Likewise, there seems to be a nice bit of marlin and sailfish around right now. Most have been caught incidentally while fishing for other species, but we’ve been hooking them all last week. Not alot, but every day is different. We had one day where almost every one of our pangas hooked at least one billfish. The next day there were only 2 hooked. Next day nothing. Day after that there were 4. All fish either broke off or were released except one which was kept and donated. As a little sidebar, we had 2 wahoo hooked and cut off as well this week. Late update: Got some wahoo late Saturday off Espirito Santo Island! This area has been a bit of a puzzle this past week. 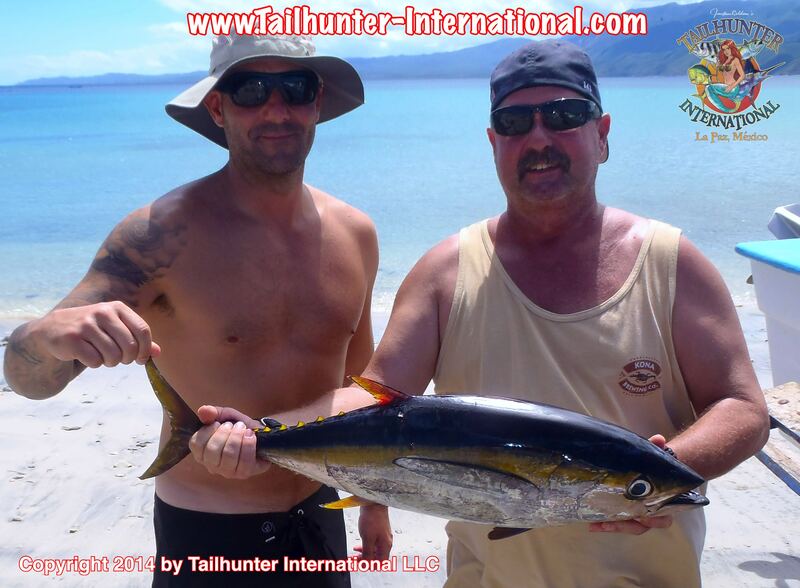 The biggest news is that we got our first football yellowfin tuna in a long long time. There’s some spots of tuna that keep popping up around Cerralvo Island with some fish up to 100-pound reported by commercial fishermen. The bad news is that we only got about a dozen footballs all week that went 12-20 pounds. That’s it. There are so many bonito around that you catch about 20 bonito to get one tuna…if at all. I mean, it’s alot of fun and alot of action. But, if you’re looking for some good ahi meat to take home, it’s alot of energy. Still, it’s nice to have the tuna around! The other downside is that if you spend the better part of your day chasing tuna, you won’t get much else. So, the counts have not been real good for our Tailhunter Las Arenas fleet. When they DO chase other species, there’s dorado around and the pangas will get 2-8 fish hooked up per day and the counts differ. It all depends if the guys went after the tuna or not. 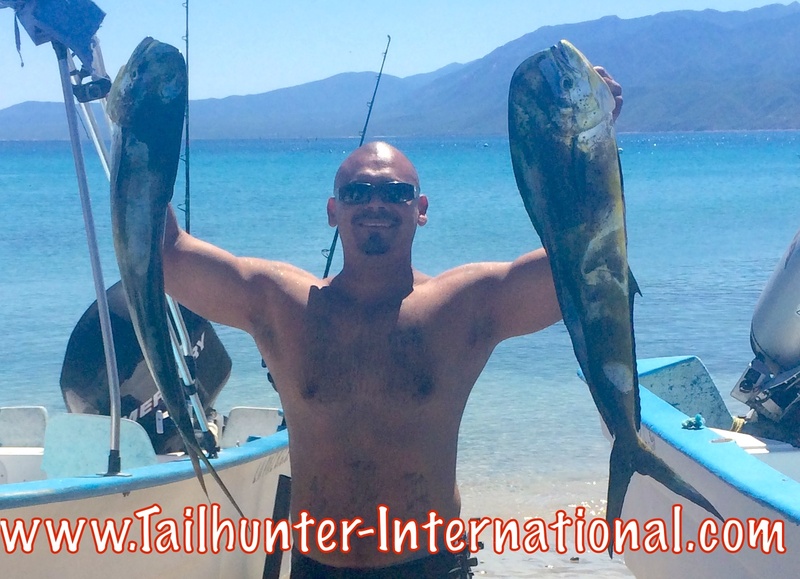 So, what alot of our guys are doing is getting their dorado and ice chests filled by fishing La Paz, then specifically going for tuna with our other Tailhunter Fleet at Las Arenas. Seems to work out OK.
Last minute update: Five wahoo taken on two pangas late Sunday up to 50 pounds! We’re up an running. Airports are open. Flights are in. The Los Cabos Airport officially opened months earlier than anticipated on Oct. 3rd and welcomed their first flights on United and Alaska on Oct. 8th with mariachi bands and water cannon salutes! Other airlines are coming online. La Paz and Loreto Airports have been open for several weeks. Still doing some cleanup in the streets and to some businesses and homes, but the heavy work is mostly done and most things are running like normal. Most visitors would never even know anything happened! Come fishing! FINALLY! Look what popped up! After seeing “signs” of tuna ever since the hurricane, we finally got a few and hopefully, these are the vanguard for a building bite! 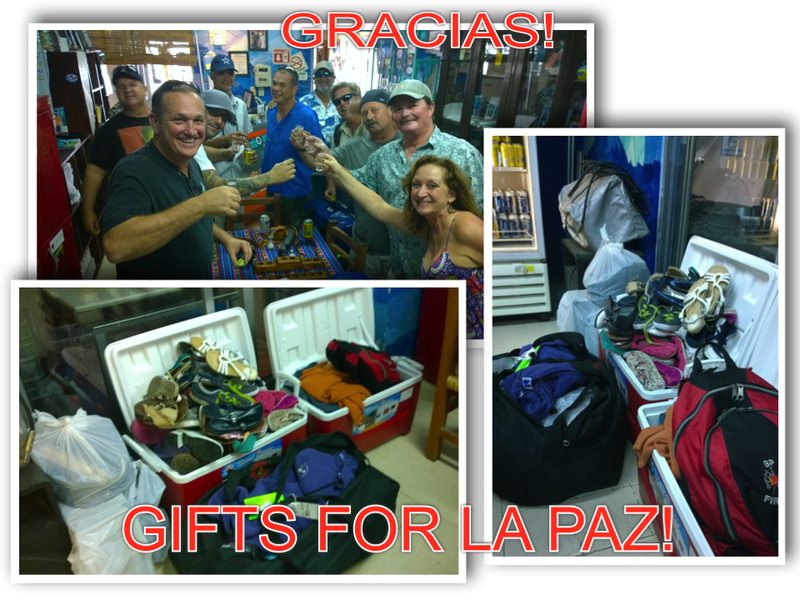 Standing on the beach at Muertos, Louie Sanchez from Denver and Don Goss from Los Angeles, jumped numerous hurdles to get to La Paz even after the hurricane! First tuna of the season! 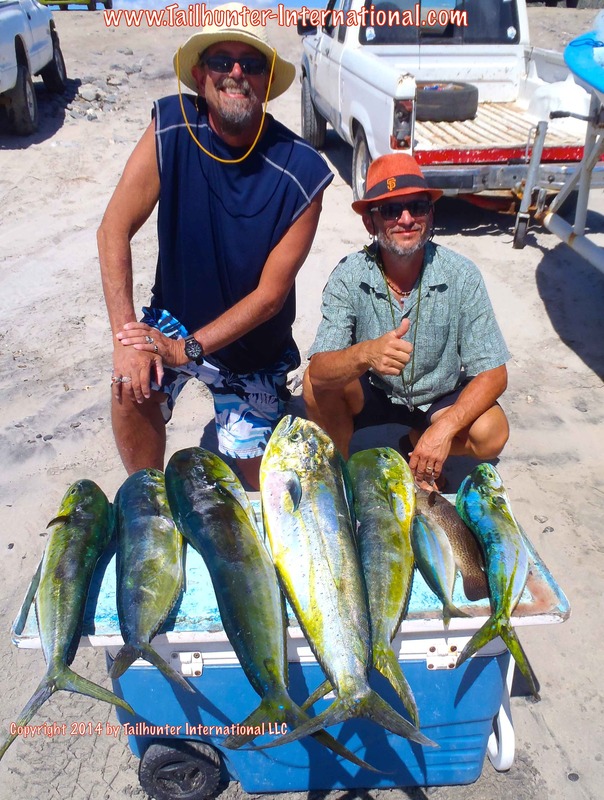 Dorado like the one here with Mike Jennings have been rolling through in solid numbers, especially west of Cerralvo Island where easy limits have not been unusual! The billfish have been restless since the storm and we had several days this past week where almost every one of our pangas hooked at least one sailfish. Most were released. 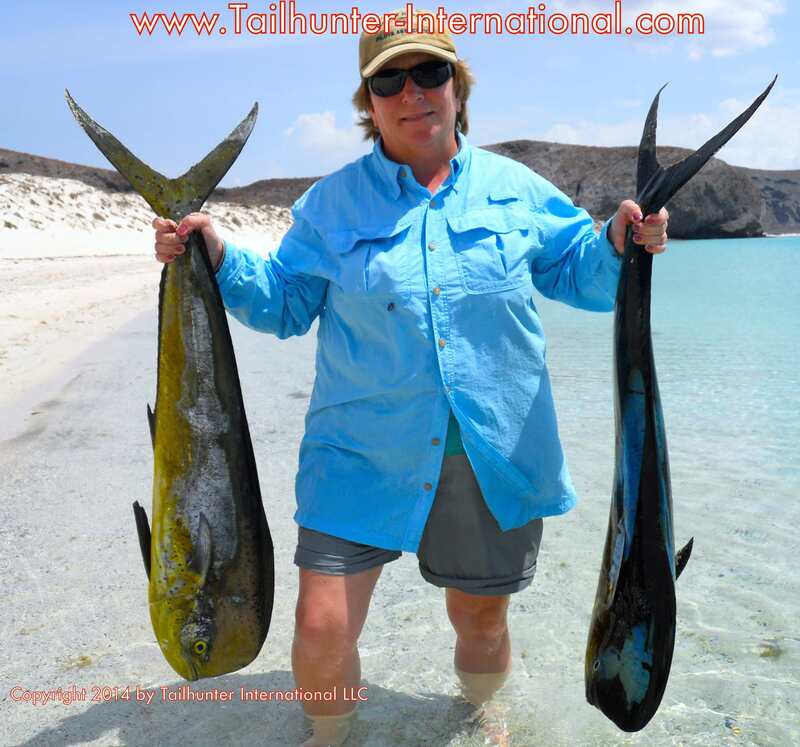 Geri Cammack with the kind of dorado that have been producing north of La Paz this past week. Except for this past weekend, weather has been some of the best of the season! For the last three weeks since Hurricane Odile, we’ve honestly had some of the best weather and condtions of the year! Blue skies…calm warm waters…very little wind. Just enough breeze to keep it comfortable. Here in La Paz, and surely in many other places in southern Baja, especially the closer you get to Cabo, there’s alot of folks who lost their homes or they were heavily damaged. So, even a “little rain” only adds more misery to a situation that was under recovery. By any stretch of the imagination, the recovery has been remarkable. The government and local authorities both public and private pulled out all the stops to get folks back on the grid as soon as possible. Much of the work has been done in record time although there are some folks only now getting back with power and water. But this is far ahead of predictions. Most notably, the Cabo Airport which had been forecast as taking months to re-open, is now open as of Oct. 3rd with flights slowly starting to trickle in. Hotels and other tourist attractions are also making great strides. As for the fishing, the great weather and conditions predicated some very good fishing these last few weeks. You could not have asked for better air and water! The only problem was that there weren’t many fishermen in town as there had been scores of cancelations, especially since there were no flights. Most of the fish were 10-15 pounds, but others in the 20-25 pound class were also found. Additionally, marlin and sailfish hooks-ups were also recorded. There’s an abundance of bonito out there so no shortage of action on light tackle. 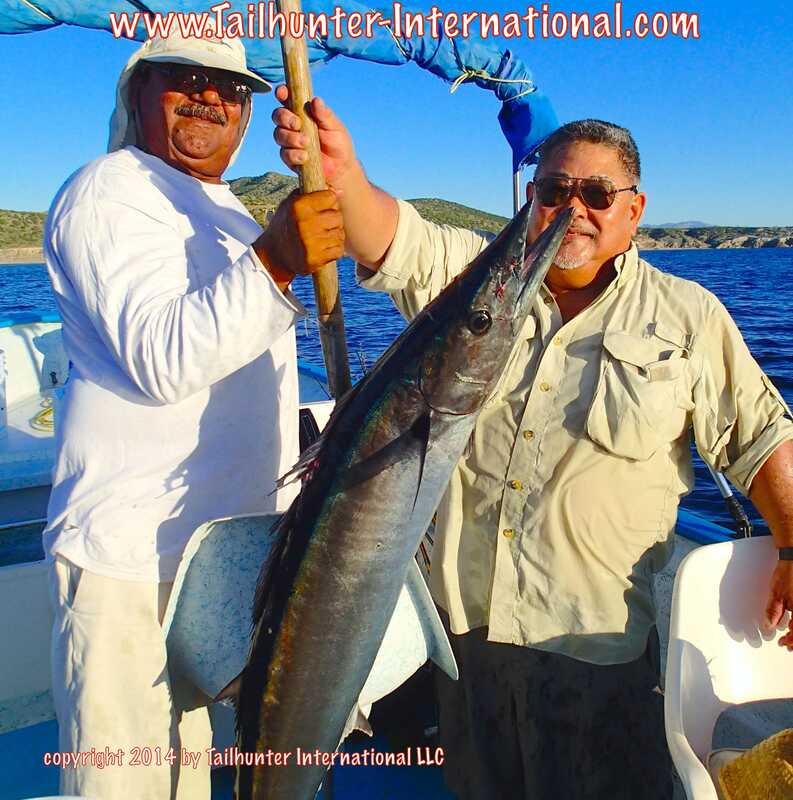 And, we also hooked a few wahoo around Cerralvo Island. Maybe the most exciting ripple of news…Commercial guys got a few tuna that hit and moved off! Then, right at the end of the week, we hit a few football tuna ourselves. The biggest problem was getting through the voracious schools of bonito, but there are tuna signs everywhere. Several private boats as well as commercial guys report tuna in the 100 pound class coming through the areas and some of our diver friends reported diving and having schools of tuna flash through! This could be good! Standing by!